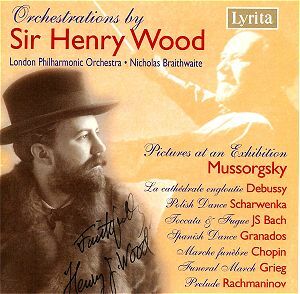 Henry Wood may be best known now as the founder of the Proms and the arranger of the Fantasia on British Sea Songs heard on their last night - now in a very altered version from its 1905 original. He was also the conductor of the first performances of Schoenberg’s Five Orchestral Pieces (1912), Delius’ Eventyr (1919) and Bridge’s The Sea (1912), and of an enormous number of first British performances including such leading composers of the time as Busoni, Mahler, Sibelius and Debussy. Earlier he had conducted the first British performances of many works by Tchaikovsky and Rimsky-Korsakov. The orchestrations on this disc date from between 1905 and 1929. By that time at the very least he was recognized as a thoroughly professional musician with a wide practical knowledge of what the orchestra can be made to do. Many of these versions were made for inclusion in concerts to commemorate specific events. The Granados, Grieg and Debussy pieces were included in concerts commemorating their composer’s deaths, the Chopin the death of Joseph Joachim, and the Scharwenka the achievement of Polish independence in 1919. Like all of the works here these transcriptions are very obviously the work of a master of his craft, capable of achieving the varied effects that he felt the various pieces require. The Debussy goes much further than mere good workmanship. It uses a gong, various bells, two harps and organ pedals as well as a large orchestra to create a complex texture of often very quiet sounds. I can’t imagine that Debussy would have orchestrated it like this, but that does not invalidate it as the working of another highly imaginative musical mind on the original piano piece. The versions of the two remaining shorter works are above all else very showy. The Bach was Wood’s answer to those critics who had complained that his orchestrations were heavily Wagnerian or suffocated the original. He therefore introduced it as being by "Paul Klenovsky", and dated it "Moscow, 1923". He was delighted when, as Lewis Foreman’s excellent notes explains in Wood’s own words, "the Press, the musicians of the Orchestra and the officials of the BBC fell into the trap, and said the scoring was wonderful, Klenovsky had the real flair for true colour etc". Wood’s pleasure at this is understandable, as was the popularity of the piece at the time. Toscanini conducted it in 1936 and more recently Sir Andrew Davis has conducted it at the Proms where it should surely have a permanent home. It’s a much better memorial to Sir Henry than the Fantasia on Sea Songs which was written in a style much more that of the bandstand and of the earlier Promenade concerts. The Rachmaninov is even more over the top and is a piece that I found immensely enjoyable. The largest piece on the disc is the "Pictures at an Exhibition", again arranged with great imagination and freedom, but inevitably inviting comparison with Ravel’s version of 1922. Whilst I greatly enjoyed Wood’s version it has to be said that in terms of imagination and ability to illuminate the implications of the music Ravel wins almost all the way. Perhaps that impression may be due in part to the greater familiarity of the latter but side-by-side comparison does confirm this view. Unfortunately the performance of this piece by the London Philharmonic conducted by Nicholas Braithwaite seems somewhat too careful, which adds to the impression at times of a painstaking and professional arrangement rather than one in which Wood’s imagination has been especially stirred. Fortunately this does not apply to the performances of the other items on the disc. Even in the Mussorgsky it does not seriously detract from the overall value of this collection which gave me great enjoyment. The late Arthur Jacobs’ book about Sir Henry lists many other arrangements, including more Bach, some of Liszt’s Hungarian Rhapsodies and various pieces by Handel. I very much hope that this well filled and well recorded disc will have the success it deserves and that it will soon be followed by recordings of some of Sir Henry’s other arrangements.